If there’s one product the miniaturization of electronics has benefitted, it’s watches. Garmin’s new Forerunner 25 manages to squeeze GPS, fitness tracking, and even basic notifications into a wearable device that reminds us of Casio’s classic digital watches that could only tell time. 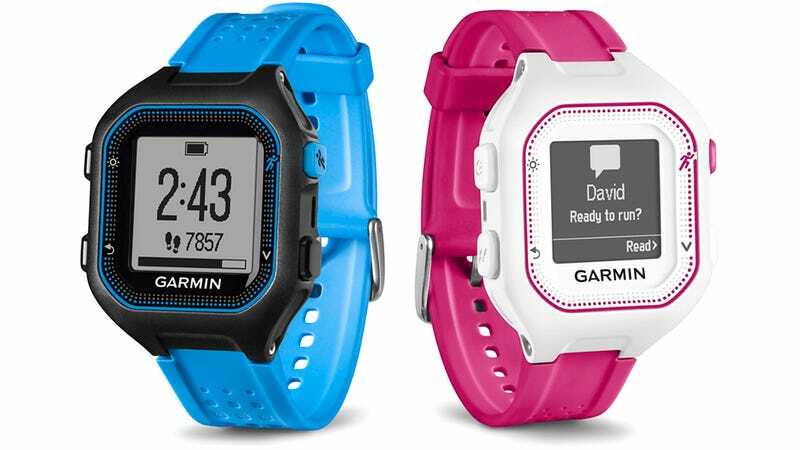 But don’t expect the Forerunner 25 to help you navigate through the woods on your next hiking trip. Its GPS capabilities are instead used for accurate distance, pace, and speed tracking while you’re out for a run. Water resistant to a depth of 50 meters, the Forerunner 25 can be paired with an optional chest strap for accurate heart rate monitoring during an intense workout, but it’s just as useful for those days when you’re being not so active with a step counter and reminder when you’ve been sitting around for too long. Available in the coming months, the Forerunner will 25 sell for $170, or $200 with an included heart rate monitor. And there will be two versions to choose from: a larger faced version with 10 hours of battery life in training mode, or 10 weeks in its basic activity tracking mode. Or a smaller faced version with a reduced battery life of eight hours or eight weeks in those same modes. But all of them come in bright retro colors that will probably remind a lot of us of the first digital watches we owned.